The Loire is the last wild river in Europe, flowing unimpeded from Mt Gerbier, in the eastern Massif Central, to the Atlantic. Yet it’s not completely wild. Levees built in the Middle Ages keep the Loire within bounds, without which it would spread out as it once did throughout the entire valley. The levees are now topped with roads, and with grass covering the sides there is no sign of this ancient flood control project. Imagine the countryside without the levees, and it becomes one grand estuary, with the river wandering and changing course every few years. 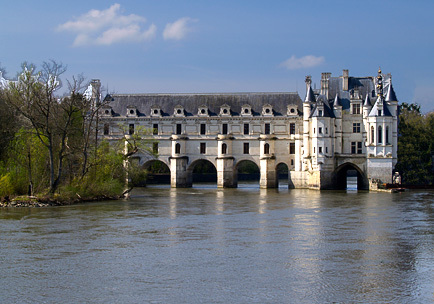 The Loire Valley and the Touraine are an important historical center of France, its many chateaux the vacation homes of royalty. staircase, completely discarded the austerities of the previous era. Such excesses eventually enraged the people who were taxed to support these follies. Nothing is left of the chateau built by the much-unloved Cardinal Richelieu, its stones taken and used for more plebian constructions. All that remains is a large park and his ‘ideal city’ which resembles a prison. Other chateaux fell in war, occasionally leaving splendid ruins like the one at Lavardin. Still others decayed through weathering and neglect, like Villandry before it was restored by a penniless Portugese aristocrat who had the good fortune to marry a rich American heiress. 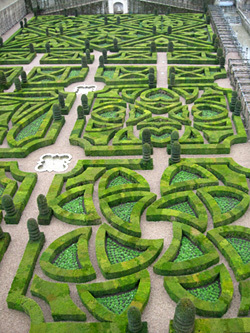 The gardens were restored to medieval paeans to Love. Medieval medicinal herbs are still grown today in the gardens of Villandry. The real wonder is not that so many chateaux have survived, but that so many have been maintained in a condition suitable for visitors. 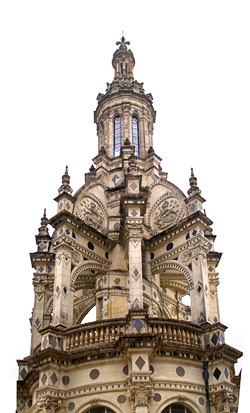 This is due to an ingenious French institution known as the Compagnons du Devoir, a guild whose members have completed a series of apprenticeships in the traditional building techniques. Once certified, they are assured of work for life: Whether the treasures of national patrimony are in public or private hands, proprietors must employ members of this guild, usually at premium rates, to do all the restoration. The name of their order (literally ‘Companions of Duty’) suggests their role as upholders of national patrimony. 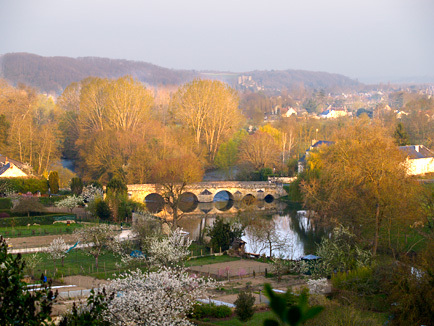 Villages announcing themselves as the most beautiful in France invite skepticism — who decides such things? The designation is surprisingly accurate, though, as a visit to Lavardin confirms. 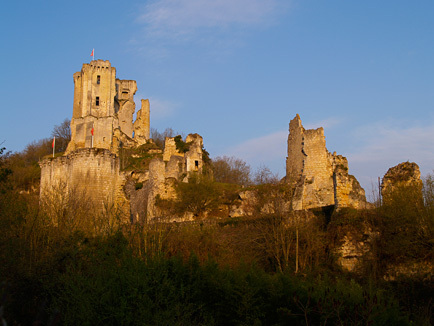 The village is graced by a splendid ruin, a Romanesque church, numerous cave houses (‘maisons troglodytiques’), and the banks of Le Loir (a tributary of La Loire). L’Association Les Plus Beaux Villages de France was started in 1981 by Charles Ceyrac, Mayor of Collonge-la-Rouge. As of 2010, the list includes 152 villages in 21 regions and 66 Departments of France. The judging is done by elected officials and partner companies, based on local history, patrimony, architectural quality, urbanity, environmental quality, the inhabitants’ savoir-faire in the art of living, and absence of theme parks and similar distractions. To qualify, the village must have at least two officially protected sites and agree to enter the Association by means of a local council decision. The selected villages are also subject to continued review and de-classification. More info here. What do Leonardo da Vinci and Mick Jagger have in common? They have both lived in Amboise. 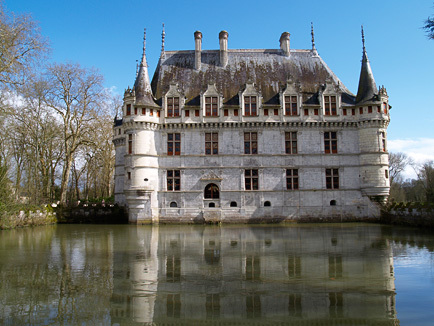 Leonardo da Vinci spent the last three years of his life in Clos Lucé, within sight of the chateau of his friend and patron King François 1st. There da Vinci continued his drawings and studies of everything from plant life to flying machines to principles of landscape. 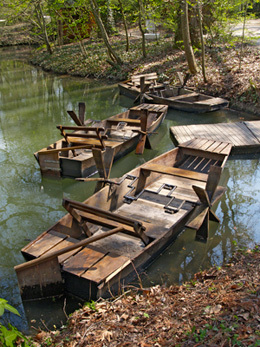 The Clos Lucé has working models of da Vinci’s inventions, including these pedal-driven double-paddlewheel boats for river transport. All of da Vinci’s inventions of course consume no electricity, and might profitably be used today, as electricity costs keep rising. Mick Jagger is (incredibly) about as old now as da Vinci was in his days at Amboise. Perhaps they’d enjoy comparing croissants at a neighborhood cafe. Saint Cyr-sur-Loire, across the Loire from Tours, hosted an exhibition of the Mongolia photogravures. A five-minute video of the vernissage (opening of a painting exhibit), narrated by the inimitable Mireille Turquois, Secretary-General of the Association Touraine-Mongolie, is here. This group consists of people who have visited Mongolia or would like to, and is part of an active program of international relations conducted by the Touraine region of central France. 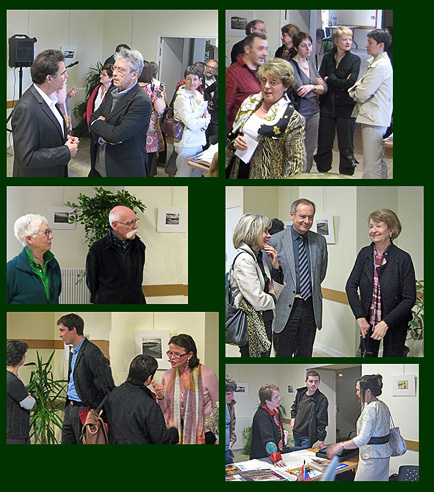 The vernissage (opening) held April 6, 2010, attracted a large number of enthusiastic viewers. Articles from La Nouvelle République, the newspaper of Tours, and the exhibit poster, are here. An April 10 conference at the Tours Museum of Fine Arts, sponsored by the Friends of the Museum, gave participants a chance to learn more about the history and technique of photogravure. Tours has a special place in this history as the home of Abraham Bosse, author of a 17th-century manual of printmaking technique that is still in use around the world. As the aptly titled book, ‘Abraham Bosse, savant graveur’, by Sophie Join-Lambert and Maxime Préaud (Tours Museum and Bibliothèque Nationale de France, 2004), makes clear, Bosse showed the way to linear perspective and tonal gradation of depth that became essential resources for all the graphic arts. Well, it’s a long way from 17th-century printmaking technique to photogravures of Mongolia, by way of an American artist living in Kamakura, Japan, but this is all within the cultural perspective of the people and political officials of Touraine. It is a privilege to take part in their extraordinarily high level of artistic appreciation, which is completely inter-twined with the art of living that the French have given to the world. This entry was posted on 24/04/2010 (Saturday) at 3:19 pm and is filed under Exhibitions, Printmaking. You can follow any responses to this entry through the RSS 2.0 feed. Both comments and pings are currently closed. R755 theme designed by varometro. 57 queries in 1.661 seconds.